Christie and Hood agent Tim Wiggins, left, with Ben and Jack Shanks, Shanks Farms, Dubbo, in the pen of lambs that sold for a new national record of $344 at Dubbo yesterday. Picture – Rebecca Sharpe. A NEW national lamb price of $344 was set at the Dubbo saleyards yesterday as quality new season and old lamb carcase weight prices strengthened to 870-1030c/kg. The record-priced pen of 64 second-cross lambs was sold by the Christie and Hood agency at Dubbo for the Shanks family, Shanks Farms, Dubbo. The Poll Dorset cross lambs dressed out at 39.4kg, with a skin value of about $10. The lambs were purchased by Fletcher International Exports. The Shanks also sold a draft of trade weight new season lambs estimated at 24-25kg cwt for $265. In June this year, 94-year-old Jack Shanks cracked $250 for a pen of lambs for the first time when 215 of the Shanks family’s lambs sold for $251.60. Jack, along with son Robert and grandson Ben, operate Shanks Farms and run 4000 crossbred ewes. The family has had a tough season, forcing them to buy grain in for the first time. “It’s the driest it’s ever been in our lifetimes,” Mr Shanks said. Colin Hood, Christie and Hood, Dubbo said lamb prices have skyrocketed. Earlier in the sale, Landmark Milling Thomas broke the previous selling centre record with a pen of the lambs from the Dixon family, Ashbank Poll Dorset stud, Dubbo that sold for $317. In the past 10 weeks, agents at the Dubbo saleyards have set and reset the selling centre record seven times and have set a national benchmark twice. At the Dubbo saleyards yesterday, the agents yarded 10,500 lambs, 4000 more than last week, and 7000 sheep, 3300 more. The National Livestock Reporting Service said consignments doubled compared to the last rain-affected market and the quality on average remained plain. There were around 750 new season lambs, but most were light weights. Most of the older lambs were also light weights; however, there were some pens of excellent grain-assisted heavy weights. The market was very solid. New season trade weights improved $5, to $196-$230, or an estimated average of 932-991c/kg cwt. The heavier drafts sold to $264. The older light weights with some cover lifted $8 to $67-$141. Trade weight old lambs sold firm to $5 dearer, with the medium and heavy weights making $145-$204, or an estimated 840c/kg. The better selection of heavy weight lambs improved $5-$10, with the lighter end making from $195 to $260 and the extra heavy weights topping at a new centre record of $344/head. These categories recorded an estimated price of 868c to 1030c/kg cwt, with those carrying plenty of weight recording the higher prices. Mutton prices were strong, with only quality contributing to any price variations. Light sheep sold from $15-$95 and medium weights made $83-$135. The better covered heavy weights topped at $165. 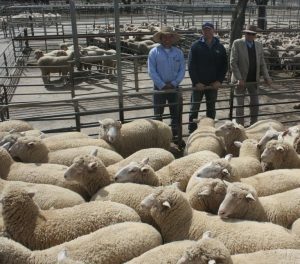 The NLRS said an extra 10,000 lambs and sheep were yarded at the Bendigo saleyards yesterday. The agents yarded 25,926 lambs, 5760 more than last week, and 13,438 sheep, 4465 more. Demand for lamb remained very strong and all the regular buyers were active. New season young lambs are dominating the offerings and there was some very good heavy weights over 24kg cwt. Price results were within a few dollars of last week taking into account quality and weight. The selection of old season lambs was very mixed and prices softened, with most buyers now showing a preference for young lambs. One agency had another big offering of small unshorn young lambs from NSW and they attracted a solid crowd of agents and farmers to average $10 dearer. Some of the smallest lambs had much greater price lifts compared to recent sales. The lead drafts of new season lambs weighing over 24kg to a top of about 28kg sold from $229-$268 to average about $244. The best pens in the 22-24kg weight range sold from $193-$250 to average $222. The plainer and light weight lambs in the 18-20kg range made $147-$178 to average about $160. On a carcase weight basis, the best young lambs with weight made above 900c/kg, while most of the plainer types were estimated at 800-880c/kg. There was solid competition from Hamilton, Horsham and Swan Hill for big lines of young store lambs, with smaller numbers going to Shepparton, Finley and the local area. Small unshorn crossbred lambs, mostly out of NSW, sold from $43-$105, to average $80. Some recently shorn young lambs with more frame and maturity made $99-$133 and averaged $121. More recently shorn ewes and wethers were yarded. Demand for good mutton was very strong and prices for the main lines of heavy and trade weight crossbreds. Merino prices lifted $8-$17. Heavy sheep sold from $135-$182, and leaner trade weights made mostly $95-$125. A good run of mutton was estimated as costing processors 450-500c/kg cwt. Very plain and light weight sheep sold from $45-$85.